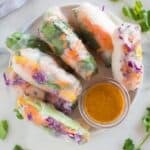 These Fresh Spring Rolls are even better than you’d find at a restaurant, and they’re incredibly easy and healthy! 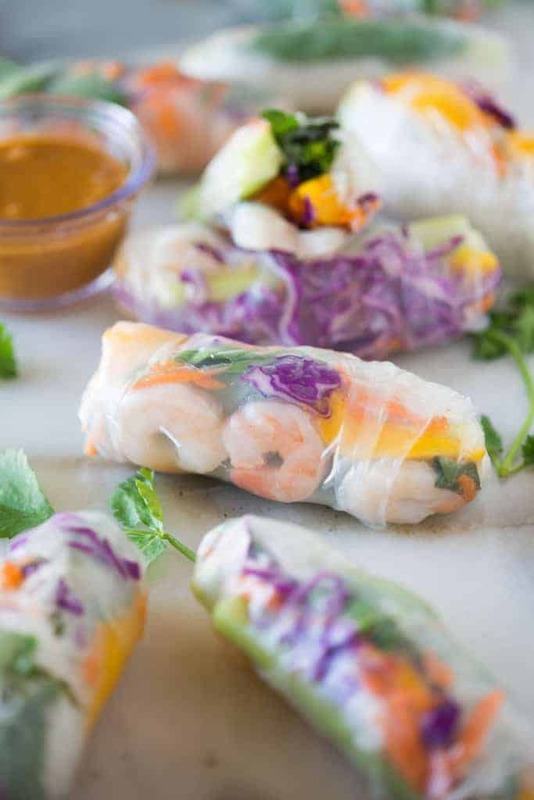 Served with a delicious homemade peanut sauce, these rolls are perfect for a fresh and light lunch, dinner or appetizer. 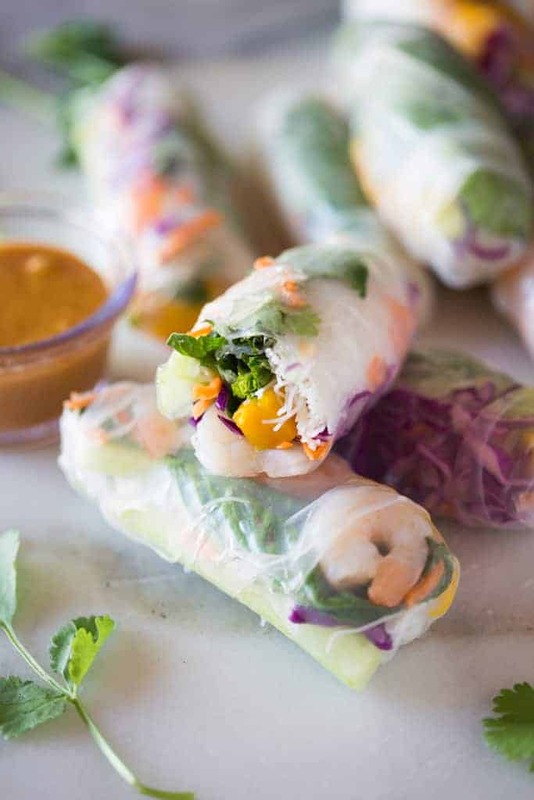 What better way to kick off springtime than by making these delicious Fresh Spring Rolls?! Sometimes when I’m coming up with recipe ideas to share with you all, I really think about what might be “popular” with readers. Other times I don’t concern myself with that at all because it’s a recipe that is really dear to me, and that’s where these fresh spring rolls come in. I’ve mentioned before that I’m completely obsessed with Thai and Vietnamese food. That’s my restaurant choice whenever It’s my turn to plan date night. These Thai Chicken Lettuce Wraps are one of my favorite recipes of all time. Then there’s these Thai Chicken Tacos and Thai Green Curry Meatballs that I make from home often. When it comes down to it, I just love the fresh, bold flavors that come from those type of recipes. I first really fell in love with Fresh Spring Rolls at a delicious, “hole in the wall” restaurant in Utah called My Thai. I had tried them many times before, but the ones from My Thai were over-the-top amazing. I have yet to find a Thai restaurant with spring rolls that taste as good. Fresh spring rolls really need to have great flavor, be soft and fresh. Also, the dipping sauce is *almost* the best part! Dip them in plain sweet chili sauce, or this really easy and delicious homemade peanut dipping sauce. AMAZING. This recipe is one I’ve made many, many times over the years, and perfected the method as I’ve practiced. I’m exited to share my tips with you! 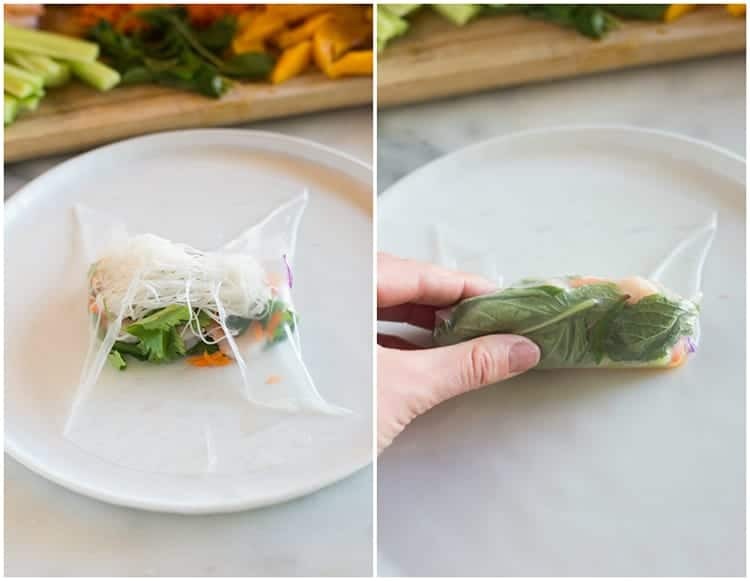 The first thing you should know when making fresh spring rolls is that they are extremely forgiving, and easy to adapt to use ingredients that you like. I’m sharing what I typically put in them, but the options are endless! I would say the only real “must have’s” in fresh spring rolls are fresh herbs, and veggies with a crunch. I always add fresh mint, basil and cilantro to my spring rolls. 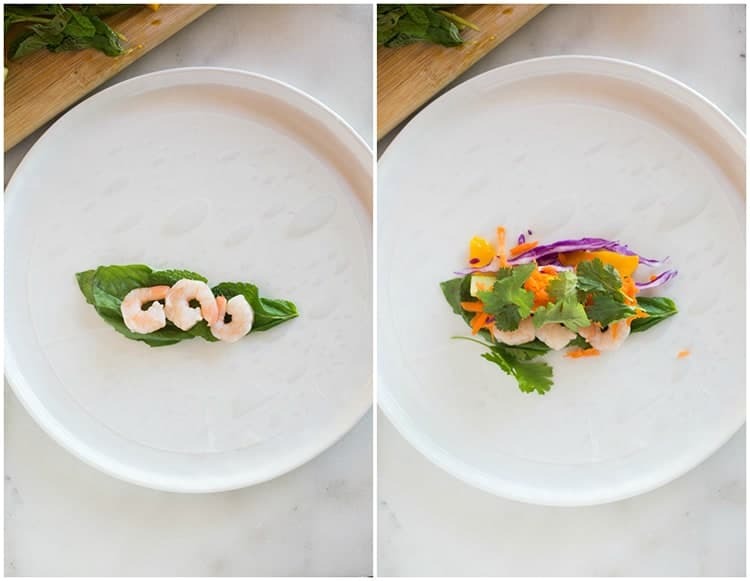 It’s a trio of fresh herbs that really make these stand out. Then, choose vegetables with a good crunch and lots of color. I also add vermicelli rice noodles, because they are a great light filler for the rolls and make them more filling. You can find them, and the rice noodle wrappers at your grocery store in the Asian food section. There are no rules here: just use what you like and what you have! Chop all of your vegetables into long, thin slices. I like to shred the carrot, but you can cut it julienne, into long thin slices, also. Assemble all of your ingredients together, including the chopped veggies, cooked chicken or shrimp, noodles, herbs, and rice paper wrappers. You should be able to find the spring roll wrapper and the noodles at your local grocery store, Whole Foods, or Walmart. Fill a large shallow dish or pie plate with an inch or so of water. Remove one rice paper wrapper from the package, and place it in the water to soak. 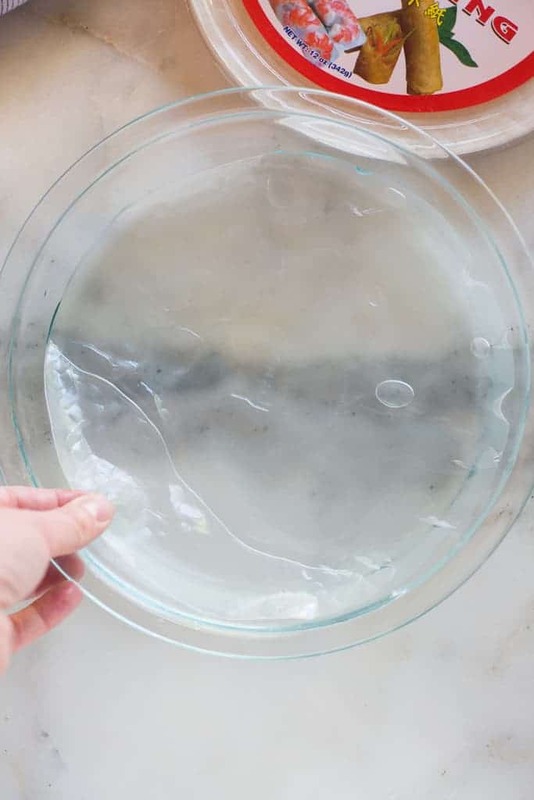 Allow it to soak for only 10-15 seconds or so, and then remove it from the water, allowing excess water to drip off, and place it on a flat surface, plastic cutting board or countertop. The rice wrapper should still feel pretty firm at this point. It will soften up more as you add the filling ingredients. If you let it soak for too long it will get too soft and will tear when you roll it up, and be harder to work with. Layer your ingredients on the 1/3 of the spring roll that is closest to you. I usually place some of the herbs or a piece of lettuce down first to act as a good base for layering the ingredients, but there are really no rules here. Add 1-2 of each ingredient, and then a pinch of noodles at the end. Pick up the sides of the spring roll and fold them in over the toppings. Then pick up the edge closest to you and pull it up and snugly over the toppings. Continue rolling, snugly, like a burrito. Practice will make perfect, but just try to keep all of the ingredients in tightly together as you roll everything together snugly. If you’re not enjoying the spring rolls right away, I would suggest wrapping each roll individually in plastic wrap. Otherwise, the spring rolls will stick together and the wrapper may tear. The rolls really taste best the day they are made, but they can be stored for 2-3 days, wrapped individually and stored in an air-tight container in the fridge. 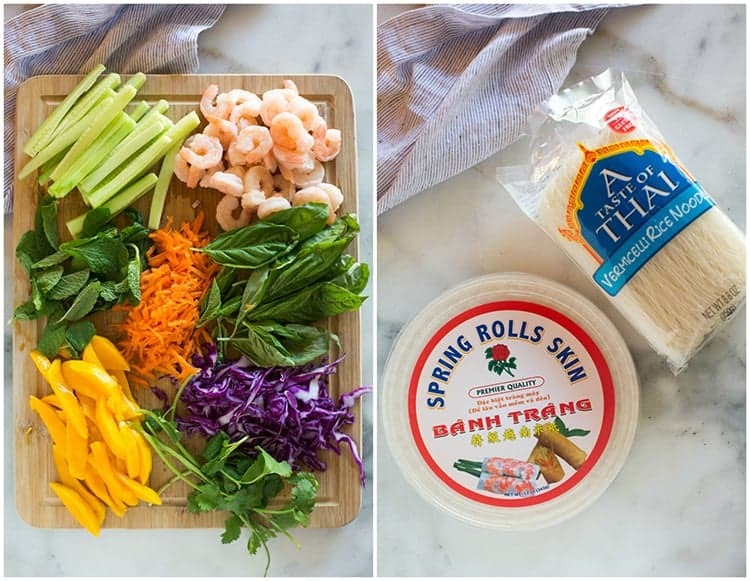 These Fresh Spring Rolls are even better than you'd find at a restaurant, and they're incredibly easy and healthy! 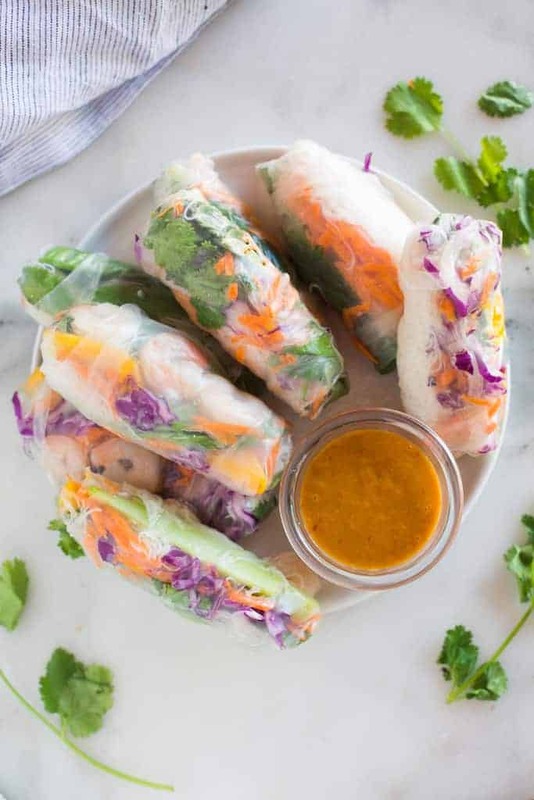 Served with a delicious homemade peanut sauce, these rolls are perfect for a fresh and light lunch, dinner or appetizer. Cook vermicelli noodles in boiling water, for just a few minutes, according to package instructions. Drain and rinse with cold water. Gather all topping ingredients together, including chopped veggies, herbs, cooked shrimp. Add about 1 inch of water to a large, deep dish, or pie pan. Place one rice wrapper into the water and let soak for just 10-15 seconds. It should still feel pretty firm as you remove it and lay it on your counter or plate. Layer 1-2 slices of each veggie, a few shrimp, a few leaves of each herb and a pinch of noodles on the 1/3 of the spring roll that is closest to you. Fold the sides of the spring roll in over the ingredients. Then pull the side closest to you up and over the ingredients, sealing everything together tightly, and rolling it up like a burrito. Add all ingredients to a food processor or blender and pulse until smooth. The rolls taste best the day they are made, but they can be stored for 2-3 days. Wrap each roll individually in plastic wrap to keep them fresh and to keep them from sticking together. Store in an air-tight container in the fridge. *I originally shared this recipe March 2013. Updated March 2018. This post contains affiliate links. I love sharing my favorite products with you! I always wanted to make spring rolls but I’ve been intimidated. Your explanation and photos of the process finally gave me the confidence and I’m so glad I did! They were amazing!!!!!!!!! I shared them with some friends and they all said they were the best spring rolls they had ever had. Thank you so much for the great recipe! WOW these were good! I served them at a girls night and everyone thought they were the best they had ever had. Hi Jayne, yes that would work. Just be aware that if you lay them side-by-side they will likely stick to each other and may tear when you try to pull them apart. …Why is that important to you, Sarah? I grew up calling them spring rolls, and learned my other Asian friends called spring rolls “egg rolls” it varies culture to culture. Perhaps, sharing your perspective instead of obtusely correcting someone would be more productive to learning your perspective. Thanks for coming to my TED Talk. how far in advance can you make them and what is the best way to transport them so they don’t stick and tear. I think they’re best served the day they are made (otherwise the wrapper dries out). The best way to ensure they don’t stick to each other or dry out is to wrap them in plastic wrap. How would you go about using chicken instead of shrimp? Rotisserie,baked, fried or canned chicken? I prefer rotisserie chicken or just chicken that has been pan seared and then shredded. Hope you enjoy them! Hi! Is there a reason for leaving out the red cabbage in the recipe? Feel free to add red cabbage or make any modifications based on your taste!